Social media can be a huge contributor to a company's lead generation efforts in both B2B and B2C. But how efficient are the various different social channels in directly driving leads? In a recent study of over 5,000 businesses, HubSpot found that traffic from LinkedIn generated the highest visitor-to-lead conversion rate at 2.74%, almost 3 times higher (277%) than both Twitter (.69%) and Facebook (.77%). LinkedIn's conversion rate also outranked social media as a channel overall. In other words, of all the traffic that came to these business' websites via social media, .98% of that traffic converted into leads, compared to LinkedIn's 2.74%. 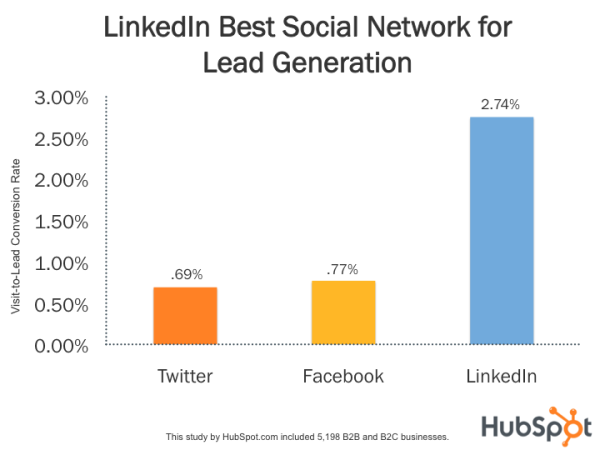 So why might LinkedIn be the most efficient social channel for lead generation, and how can you use that to your advantage? People join LinkedIn to showcase their career, work expertise, and find content and information to make their professional lives better. So businesses who target other businesses will naturally find a higher concentration of their target market on LinkedIn. Also, when someone visits LinkedIn, the person is most likely in a business-focused mindset, helping business' content perform inherently better. So what about B2C-focused businesses? Less content is generally posted to LinkedIn than to other social networks, which is probably because people almost exclusively post marketing-related content as opposed to their children's photos or social "chatter." This means there is less clutter on LinkedIn, making a person capable of consuming a higher percentage of the content that's active on LinkedIn at any given time. In other words, a business' marketing posts are more likely to be noticed on LinkedIn than somewhere else. So what should you do when you find a specific social channel that's a slam dunk for your business? 1. Invest time and effort to grow that specific channel. The trick, however, will be trying to maintain a quality network as your community scales. 2. Post more of the targeted content that's working. If you notice people are specifically really enjoying blog posts, webinars, or something else -- keep offering it! How can you tell what content's working? Monitor comments, likes, shares, and clicks. 3. Find more opportunities to post relevant CTAs. Can you sprinkle more lead generation opportunities throughout your social media updates? It's quite a balancing act, but a solid mix of calls-to-action (CTAs) and other content is healthy. 4. Don't take success for granted - keep learning. It's easy to get comfortable when something is going well. Remember, there are always opportunities to improve. Keep testing, analyzing your data, and increasing results! What type of conversion rates do you experience per network? Is the data similar to your own results?